Most people aren’t sure where to start when it comes to saving. It’s easier than most people think to start saving a little at a time and let it add up. 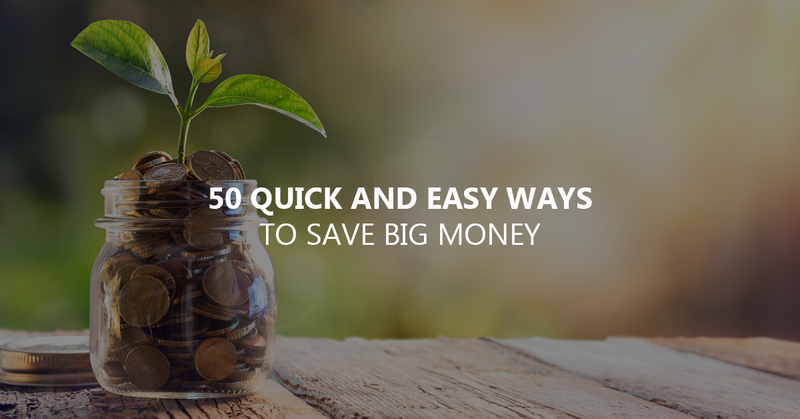 Here are 50 quick and easy ways to save big money. Save change in a piggy bank or a large container of some sort instead of losing it in the couch cushions. Clip those coupons out of the Sunday paper. It’s possible to walk out of the grocery store with incredibly low cost or even free groceries and household items. Carpooling with friends and co-workers is a great way to save money on gas and keep vehicles running longer. Use less expensive brands to cook meals at home. Many of the store brands available at the local market cost much less and taste just as good. Stop wasting energy when no one is in the room. Everyone in the family needs to be sure to turn off lights and electronics when they leave a room. Lease a room or get a roommate to help share the cost of rent. Start a garden in the yard or even in an apartment, most gardeners save big money and get the best vegetables and herbs available. Eat at home at least five nights per week. Cut out expensive habits such as smoking or drinking. Cigarettes easily add up to about one hundred and fifty to two hundred dollars per month. Sign up for reward cards at stores, gas stations, and even online. Fun can be free. There are lots of fun activities that don’t cost a thing, look online or in the newspaper to find some local events. Make freezer meals by purchasing the ingredients, making the meals, and then freezing them. Generic prescriptions are one of the most recommended ways to save money. Some prescriptions cost hundreds of dollars, unless the generic alternative is available. Buy quality not quantity for major or minor purchases. Buying a quality product that will last is much more affordable than buying cheap items that just need to be replaced sooner. In home water filters will save hundreds of dollars in no time versus purchasing bottles of water. Hang clothes to dry rather than running an electric dryer. Take advice from finance experts by either reading blogs or subscribing to one of the many newsletters for finance advice. Use a credit card with cash back for everyday purchases. Be careful with financing such as credit cards. Even though it’s possible to earn cash back there is interest on credit cards. Sell collections such as old electronics to make money and clear up some clutter. Say No whenever an expense doesn’t seem vital. A little self-control can go a long way and could be very rewarding in the long run. Stay home rather than going out. A night of binge-watching Netflix can be just as fun as going out with friends. Drink water rather than soda or energy drinks. A well-hydrated body not only feels better and water is much less expensive. Low energy appliances and electronics save hundreds for most homeowners. Shop around rather than making convenient purchases. It’s almost always possible to save money by looking for the best deal around. Plan ahead with family members and significant others. Being prepared and thinking ahead for expenses makes it a lot easier to avoid mistakes or prevent financial flubs. Revise your plan once in a while, make sure everything is on track and there are no adjustments that should be made. Be patient let the deals come to you. Waiting until after Christmas to buy gifts for next year leads to some pretty great savings. Shop local rather than going to the mall or boutiques where items are overly expensive. Use the ten-second rule by stopping for ten seconds to ask whether you really need an item. Use a visual reminder of bills and other expenses to stay on top of payments and make sure nothing slips through the cracks. Bring lunch to work rather than spending ten dollars at the nearest cafe or restaurant. Repair rather than replace. There are lots of Instructables and tutorials for making household repairs available online or from books. Buy in bulk when it comes to items that will definitely be used. Laundry soap and some food items are a great way to start. Use benefits from work such as student loan assistance to help get out of debt. Most employers have detailed information about the benefits they offer. Ask about waiving fees when signing up for a new bank account or other services. Get in shape to avoid illness and reduce the cost of medical care. Eliminate entertainment costs by connecting a computer to the television and streaming media rather than paying for cable. Learn from mistakes instead of getting frustrated when there’s a financial slip-up. These lessons will pay off in the future. Buy a deep freezer and stock up on food and drinks. Most items stay fresh for as much as a year in a freezer. Reuse groceries by making meals from leftovers. Breakfast is the most important meal of the day. Eating a good breakfast means less snacks throughout the day. Volunteer at your local community center to help reduce student debt and have fun without spending a penny. Craft gifts rather than buying them. Handmade gifts mean more and cost less. Buy used when possible. When a used item is in good condition there’s no need to spend on extra on a new item. Cancel subscriptions that aren’t being used or don’t live up to expectations. Turn to family and friends for support when possible. Having a backup system for stressful times will help in unexpected ways sometimes. Stress spending can be devastating to someone trying to save money. With a little support that habit can be broken for good. Don’t one-stop shop, making several stops might be less convenient but it can save money when bargain hunting. Program the thermostat to shut off when no one is home.